Today, it is my pleasure to write a letter of recommendation for Barton James Christner. As the owner of Arbor and Vine, an online retail store, I require the highest quality photography. I've worked with photographers prior to Bart and must tell you that there has been no comparison. Bart and I have had a professional relationship for the past two years. What initially put my mind at ease was Bart's resume and the fact that he has done product photography. That type of photography is of paramount importance to a store such as mine. 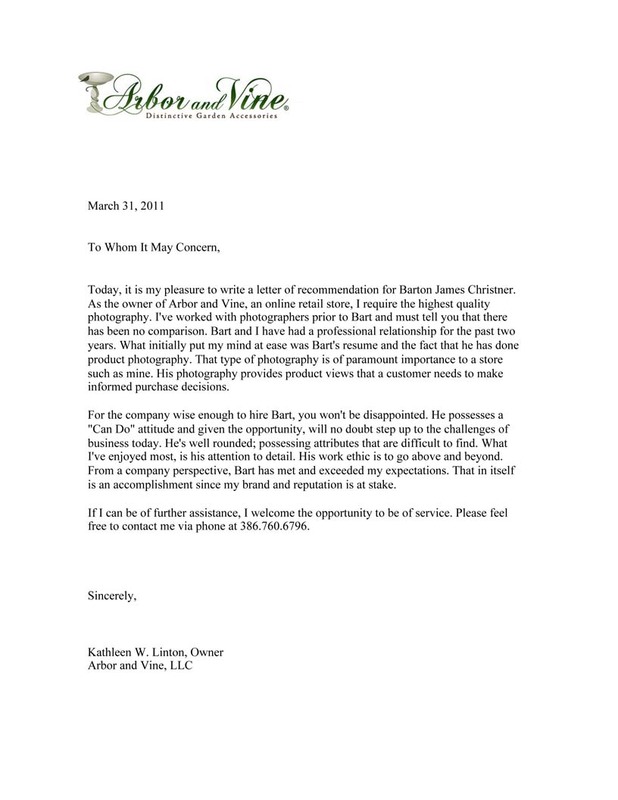 His photography provides product views that a customer needs to make informed purchase decisions. For the company wise enough to hire Bart, you won't be disappointed. He possesses a "Can Do" attitude and given the opportunity, will no doubt step up to the challenges of business today. He's well rounded; possessing attributes that are difficult to find. What I've enjoyed most, is his attention to detail. His work ethic is to go above and beyond. From a company perspective, Bart has met and exceeded my expectations. That in itself is an accomplishment since my brand and reputation is at stake. If I can be of further assistance, I welcome the opportunity to be of service. Please feel free to contact me.